Incoterms are the official International Chamber of Commerce (ICC) rules for the explanation of trade terms. Incoterms 2010 are adhered to by all major trading nations of the world, and it is the authoritative text for determining how costs and risks are allocated to the parties conducting international transactions. Incoterms facilitate the conduct of international business by defining the responsibilities of the involved participants. Today, we’re discussing the Incoterm FOB, also known as Free On Board. 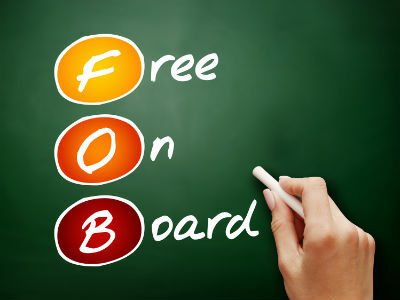 What Does the Free On Board (FOB) Trade Term Mean? When Can FOB Be Used? FOB can be used only for ocean vessels. With FOB, the seller delivers goods, cleared for export, loaded on board the vessel at the named port. Risk passes when the goods are on board the vessel, and the buyer bears all costs from that moment onward. Watch out when using FOB, as it is often misused in exporting. The United States’ UCC permits the use of FOB here, there and everywhere. However, Incoterms 2010 restricts the use of FOB to ocean shipments only.